All users must use the Pulse Secure desktop application to connect to dbRAS. Please follow the guide below to begin using Pulse Secure. Note: you must be connected to the bank network to perform the below steps. Please connect from the office or via Network Connect or dbRASnet before completing these steps. Make sure your device is connected to the Bank’s network. A web browser will open to the ASD homepage. If prompted, select your preferred language. 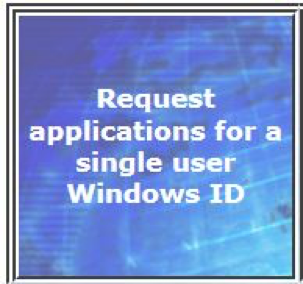 Select Request applications for a single user Windows ID. Enter/confirm your Windows User ID, then click Submit. From the Application Search page, type Pulse Secure, then click Search. Locate Pulse Secure 5.2, then click the Add to cart button. Confirm your selection by clicking the Checkout button located at the bottom of the page and Submit Request on the next page. Return to the DB MC7 Application Delivery Agent window - Available Applications tab, then click the Refresh button. Locate Pulse Secure 5.2 in the Available Applications list. If Pulse Secure is not in the list, wait 10 minutes and click Refresh again. 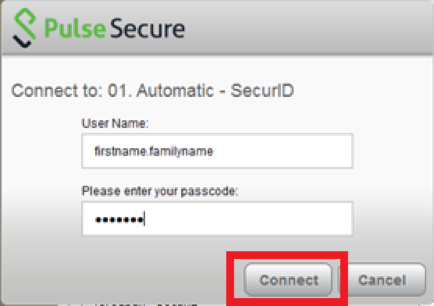 Click the check box next to Pulse Secure, then click the Install Selected button. Click "Connect" on "01 Automatic - SecurID"